The first spring harvest, perhaps. Hops shoots have been gathered and used as a green vegetable for many generations although in the UK they have fallen from favour, perhaps as a result of the shrinking of the hop farms of Kent and I have never seen reference to them in France. We don't have many hop plants but they are strong growers and very vigorous, it seems safe enough to take a handful of shoots for a spring snack. Take just the top few cms of the shoot, longer shoots are tougher and you need to leave a node or two to shoot again or you'll have no hops in the autumn. 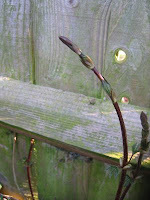 Of course, if your bines are managed intensively you may prefer to limit the shoots to just one or two strong growing tips and sacrifice all the rest but our rather haphazard plants seem happiest with a tangle of new growth each year. 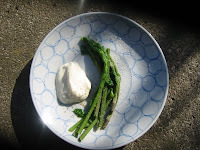 Cooking is simple, drop the hop shoots, tied for tidyness if you like, into a pan of simmering water. They take only a couple of minutes to cook like this and I served them with rather a lot of salt and pepper and a dab of vegan mayo as a summery nibble. 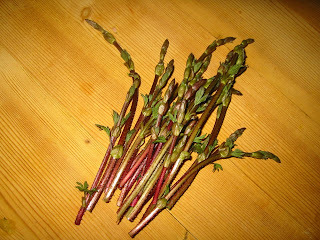 They'd also be great chopped and added to rice at the end of cooking or used in a flan or tart in the manner of asparagus.